On March 19, 2013, Bob Newman had a seizure that caused him to suffer severe head trauma. As a result, Bob ended up slipping into a coma at the hospital. Unfortunately, his insurance will not cover some of his medical expenses, and Bob will also have no income until he is able to resume work as a freelance consultant. Therefore, a group of his friends and colleagues decided to launch an online fundraising campaign to help Bob’s family deal with their current financial situation. By using DonationTo.com to create their fundraising page Bob and family will keep 100% of all donations and avoid credit card fees. Today they have saved over $2,300 by using DonationTo. The hosts of Bob’s fundraiser compared all of their options so that they could select the optimal way to raise money online. They selected DonationTo because they will be able to give Bob’s family 100 percent of the money that they raise. Additionally, we enabled them to avoid paying credit card processing fees that are typically tacked on by other fundraising sites. The decision to utilize DonationTo has already saved the group more than $2,300 in fees. Another perks of collecting online donations via DonationTo is that it is not necessary to already know how to fundraise. Instead, we provide a nice selection of tools that will make it easy for anyone to learn throughout the process. 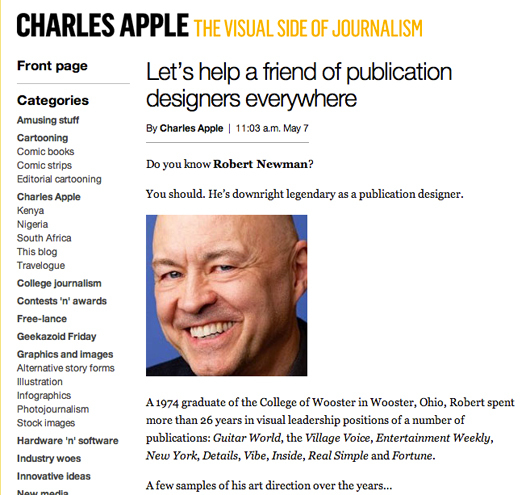 Bob Newman is a well-known graphic designer who has worked for several different magazines, including Details, Fortune, New York, Reader’s Digest, Real Simple and Southern Living. Because of this, the fundraiser has received a lot of industry support. AdWeek ran an article on May 8 about the fundraiser in order to generate additional online donations, and almost $7,000 was donated during the next four days. At this point, the fundraiser has generated almost $41,000 of the $50,000 goal. Several of the top names in media have made a contribution to Bob’s campaign, including Martha Nelson from Time Magazine, Richard Turley from Bloomberg Business Week and designer Joe Zeff. 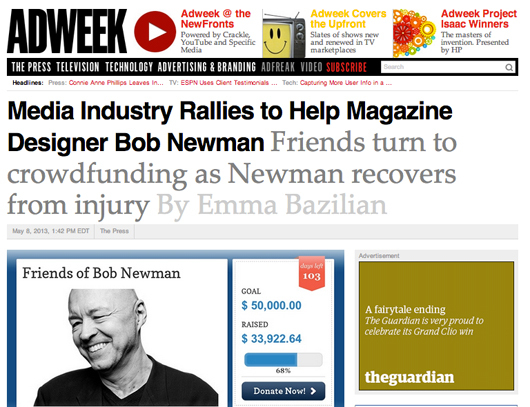 This level of industry support will provide the Newman family with some much-needed financial relief, and they will be able to access the money as it is donated instead of waiting until the entire campaign ends. In the meantime, Bob can focus on working with his physical therapist in order to regain the full usage of his body and speech so that he will eventually be able to resume having a normal life. On May 7, the American Copy Editors Society (ACES) published a blog post that looked back at Bob’s amazing career and encouraged his colleagues and fans to show their support by making an online donation. Bob has worked for more than 26 years in variety of media leadership positions, and his art direction has been displayed on the covers of a long list of some of the most recognizable publications in the country. The ACES also provided the link to the Friends of Bob Newman Facebook page so that interested parties can receive regular updates on his progress. Utilizing social networking is one of the best ways to get the word out about an online fundraising campaign. To help make Bob’s story go viral, Muck Rack is collecting a list of tweets that mention the fundraiser. DonationTo strongly encourages anyone who is running a fundraiser to use Twitter, Facebook, Google Plus, LinkedIn, Pinterest and Instagram to gather additional supporters. You can easily double or even triple your exposure by simply posting a short blurb about the fundraiser and sharing the link on each of your social networking pages. Several industry members have used the power of Twitter to inform others about Bob’s condition. For example, Andrew Losowsky of the Huffington Post has used his Twitter account to inform his followers about the fundraising campaign. To date, there have been more than 40 unique posts made about the fundraiser for the Newman family, and several of them have also been re-tweeted by other people. Although it is impossible to know for certain how much money these tweets generated, they have definitely made it easier for people all over the world to learn that Bob needs financial assistance for his medical bills and living expenses during the recovery process. Bob Newman’s colleagues immediately went into action after they found out that the well-known media industry professional had suffered a serious medical issue. The Friends of Bob Newman fund was launched via DonationTo in order to help Bob and his family deal with the financial burden that his illness has placed on them. By selecting DonationTo, the fundraiser has already saved more than $2,300 in fees, and the hosts have been able to give the Newman family each contribution in real-time. As an added bonus, Bob’s group of colleagues did not need to know how to fundraise before they started the campaign because DonationTo provided them with access to useful tools and educational blogs. To know how to crowd fund for your medical expenses, please sign up our donation website and start your medical crowdfunding campaign.